Starting a clothing line and opening a store off the back of a magazine might not seem like a natural course but that's exactly what the guys at Fourth & Main have successfully managed to do. Close to Carnaby Street Fourth & Main seem to have captured the essence of the area's independent history now lost to rows of multi-national brands. The men's ready-to-wear collection sits alongside plenty of reading matter in this clothes come bookshop come photographic gallery with ambition to become a creative hub. 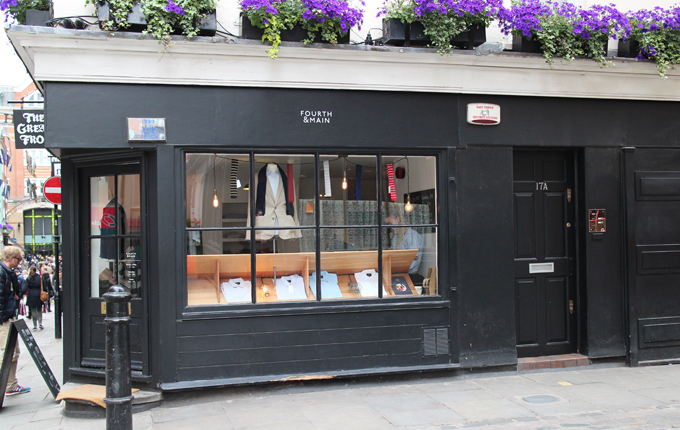 As well as a hand picked selection of the world's finest independent zines Fourth & Main also have their own, Savile Row trained, in-house tailor offering fine suiting and bespoke tailoring at an accessible price point with fine fabrics sourced from around the world.